When setting up a network, one of the first decisions made is what kind of ‘topology’ to use. A network topology dictates how different sender and receiver nodes will communicate with each other. Each type of topology will have its advantages and drawbacks, making it important to pick the typology that will give you the best performance and stability for your network. There are loads of different types of topologies, but today we’re going to focus on the most popular one: star topology. 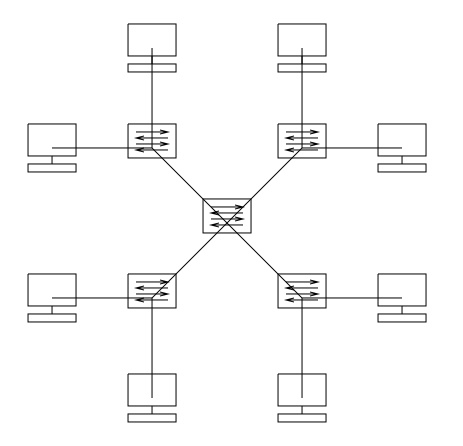 With a star topology setup, each node (such as a computer) within your company or team is connected to one central network device (which could be a hub, a switch, or a computer) via a cable. The central network is the server, and the other devices are clients. Star topology (or ‘star network’) is the most widely used network for LANs. It was first popularized by ARCnet, before being adopted by Ethernet. 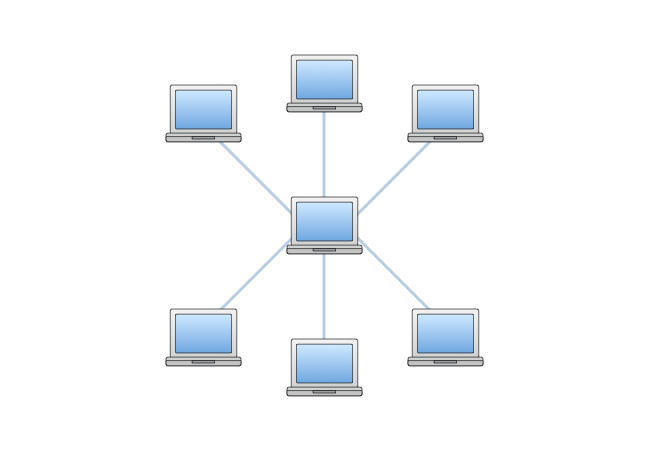 If the nodes (or computers) want to communicate with each other, they pass the message on to the central server hub, which then forwards that message back on to the different nodes (computers). If you picture this flow of information, it looks like a star – which is how this network got its name! In some circles, this central node / hub is also called a ‘root’, and the peripheral hosts are called ‘leaves’. Let’s say one computer wants to send data to another computer. The first computer will forward the information to the hub. The hub will then check the address of the recipient computer, then forward the message on. But the hub has no memory of its own, so when the first computer sends over the information, the hub then needs to ask all the other computers and ports which of them owns that address. This procedure is called Address Resolution Protocol (or ARP for short). Essentially it means that the hub can find the correct address of the recipient computer and transfer the data to the right place. In terms of cables, star topologies are sometimes implemented with Ethernet/cabled structures, wireless routers, and other components. These additional nodes are clients, and all link back to the central hub. No topology is perfect, and the star version has its fair share of good and bad points. If one node or connection breaks, the rest of the network remains unaffected. Other computers and their connections can continue working with zero downtime. It’s highly scalable: new computers/machines can be added or removed without disturbing the whole network. Heavy loading = no sweat. Star networks can accommodate lots of different machines, which means it’s possible to create a large network. Star networks are safer in the event of a cyber attack. Let’s say you run a bank with several branches. If one branch or office comes under attack, the server will be notified and prevent a second. One branch goes down, but the others continue running in complete safety. Phew! Each cable is individually connected to the central server, which means you’re going to need A LOT of cables. And that doesn’t come cheap. Although it’s worth noting that the upfront cost of cables is a fraction of the cost of downtime in the event of a total system failure. Most network designers think this benefit far outweighs the cable cost. The hub is a single point of failure, which means that if it stops, it brings the whole lot down. In reality, there are only so many machines you can connect to a central server before you start running out of cable length and ports. One way to get around this is to extend the star topology into multiple stars with a new central server in the middle. 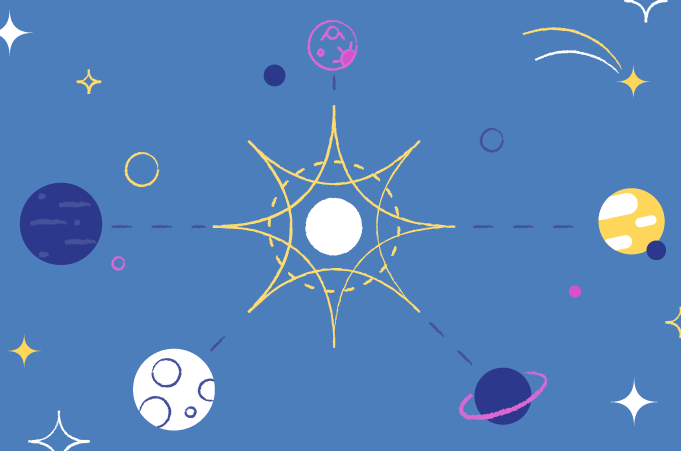 In this situation, messages from each system are transferred to its star, which then transfers it to the core server, then back out to the star and then to the destination system. Systems administrators and network designers have lots to consider when planning and implementing a topology. One way to make this job a little easier is to create a network diagram to help you communicate your design, deployment, and topology plans across the team. Putting your star topology plans to paper helps you plan, as well as identify any mismatched connections or weak points. It also helps you and your team avoid misunderstandings and mistakes; think of it as a blueprint or map to your network layout! Using dedicated diagramming software can really take the stress out of designing your network. Rather than wrestling with weird clipart boxes and arrows, you can just grab a template from a pre-made list, then edit it with custom icons (including Amazon Web Services (AWS) icons and Google Cloud Platform (GCP) icons), arrows, boxes, and colors. Plus, if you’re using Cacoo — our own diagramming tool – you can store your diagrams in the cloud, share and export everything in real-time, and allow simultaneous, tracked editing as you go. All of this means you can get your architecture setup just right the first time.